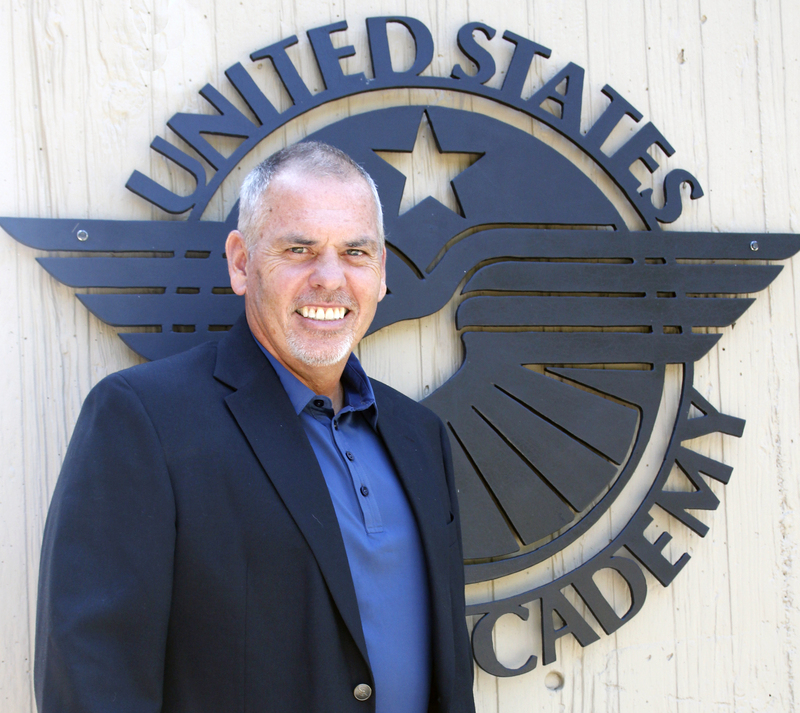 DAPHNE, Ala. – United States Sports Academy national faculty member Charles Temple of Wilmore, Ky., recently took part in the Academy’s program to enhance the training of soccer administrators in the United Arab Emirates (UAE). 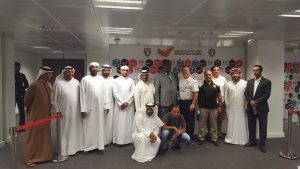 Temple – and experienced college athletic administrator, coach and instructor in higher education – taught a sports administration course from 5-16 March 2017, to students at the United Arab Emirates Football Association (UAEFA). The Academy played a role in the development of the Football Club Operators License Program in cooperation with the UAEFA. The agreement between the Academy, its Emirati colleagues and the UAEFA led to the development of the Football Association Academy (FAA). “Regardless of cultural differences, sport is a common language and interest around the world,” Temple said. 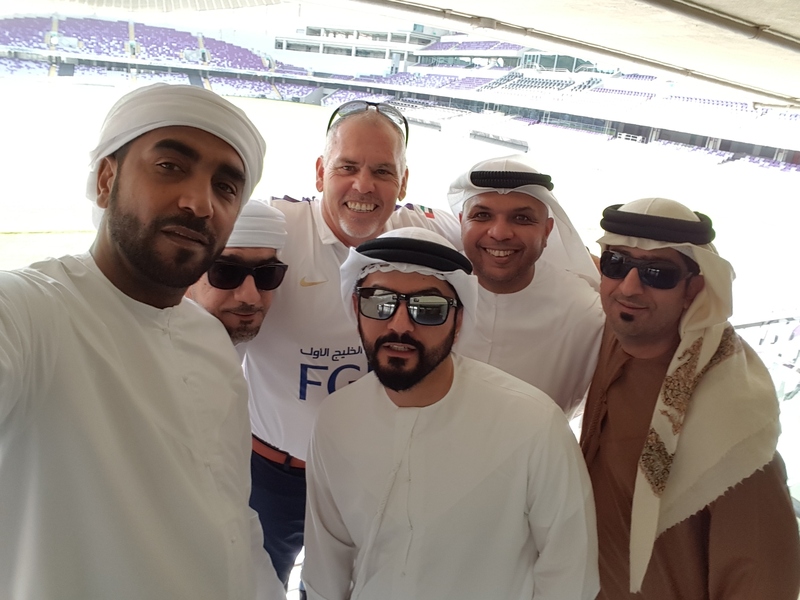 “The students that I had the privilege to work with in Dubai love their country and love their sport. What better combination can there be for developing a classroom of learning? 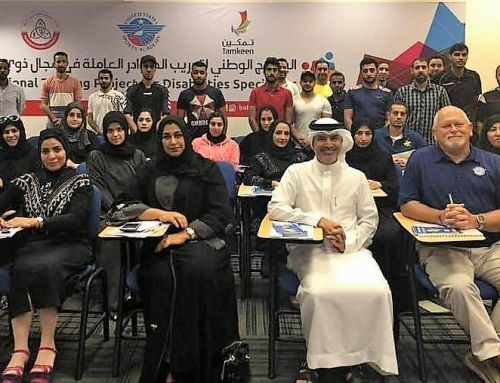 United States Sports Academy National Faculty member Charles Temple poses with students from the United Arab Emirates Football Association Academy in Dubai. Temple has served as a Sports Management Specialist for the Academy for the past four years and taught in Dubai on behalf of the Academy as recently as September 2016. Temple also recently returned from Thailand, where he taught sports coaching and methodology to students at the Sport Authority of Thailand.  The Academy is conducting its International Certification in Sports Coaching (ICSC) and International Certification in Sports Management (ICSM) programs in Bangkok, programs that have been in place more than a decade. Temple has served as a faculty member for the Academy’s international programs in Thailand, Malaysia and China. He is an experienced college athletic administrator, coach and instructor in higher education with more than 38 years of experience. He also currently teaches fitness, sports coaching and sports management courses at Asbury University in Wilmore, Ky.
Temple has taught sports management classes at the University of Kentucky as well as fitness and wellness classes at Indiana Wesleyan University. He was the athletic director at Lexington Christian Academy in Lexington, Ky., from 2010-12, and district athletic director and fitness and wellness teacher at Jessamine County Schools in Nicholasville, Ky., from 2000-10. United States Sports Academy National Faculty member Charles Temple poses with students and administrators from the United Arab Emirates Football Association Academy in Dubai. In addition, he served as director of athletic facilities and head men’s soccer coach at Asbury College in Wilmore, Ky., for four years. He was director of athletics, head men’s basketball and head men’s soccer coach at Toccoa Falls College in Toccoa Falls, Ga., for eight years and served as athletic director at Miami Christian College and Central Jersey Christian School early in his career. In addition to his administrative duties, Temple has coached soccer, basketball and baseball as well as taught health, sports and fitness related courses since the mid-1970s. 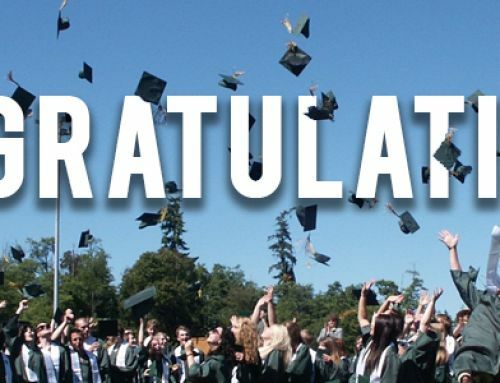 Temple earned a master’s degree in athletic administration and physical education management from Trenton State College and a bachelor’s degree in health, physical education, and recreation from The Kings College in Briarcliff Manor, N.Y.
Over the years, Temple has received numerous awards and recognitions. He received the NIAAA Kentucky State Award of Merit in 2009 and a NCCAA National Meritorious Service Award in 1993. He has received conference and region Coach of the Year honors in baseball, soccer and basketball. Temple also served as NCCAA National Men’s Soccer Chairman from 1988-1990 and the NCCAA National Men’s Basketball Chairman 1990-1992.